World Youth Alliance | 45 young voices, 5 nations, one document: European Youth United 2019 in Madrid. 45 young voices, 5 nations, one document: European Youth United 2019 in Madrid. 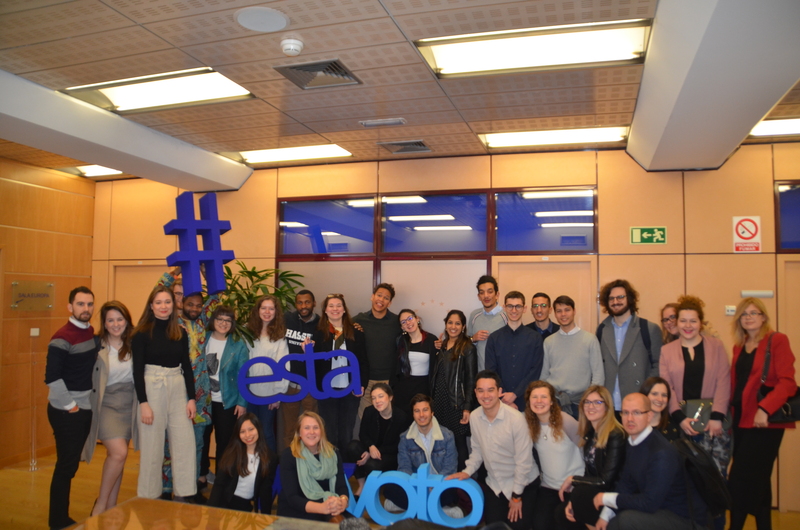 09-12 MARCH 2019, MADRID, SPAIN – Last week, the World Youth Alliance (WYA) Spain organized the Erasmus+ project “European Youth United” in Madrid in collaboration with WYA Europe. In those four days 45 participants from Austria, Poland, Croatia, Belgium and Spain came together to talk about youth issues and to work on the Youth Policy 2020 that will be presented by WYA Europe to the European Parliament during the annual Emerging Leaders Conference in Brussels. After their arrival in sunny Madrid, the project started on Saturday in the central Iván de Vargas library, where Elisabeth Gudenus – Regional Director of WYA Europe – explained the history and mission of the organization to the new members. Due to the fact that the participants didn’t previously know each other, the group went through an ice breaker exercise to get to know their fellow colleagues. All the young people were open in getting to know each other and in talking about their own lives and dreams. This showed to be true even when the different national teams presented the youth issues of their countries. Everyone had something to say and participants shared how they are involved in local problems. Other nationalities would often connect and compare their issues with others, which made it easier to summarize them and find a few core problems. Moreover, to make the participants familiar with WYA’s advocacy activity, Francesco Carboni – WYA Europe’s Regional Director of Advocacy – held a presentation about the different institutions of the EU, and explained how to get in contact with Members of the European Parliament (MEPs) in the European Parliament and advise them before they vote on any kind of official text. The aim of the project was for participants to create their own amendments on a draft paper on Youth Rights which included sixteen paragraphs. For that, they came together in smaller focus groups and worked in a fun atmosphere. The group also visited the Representation of the European Parliament in Madrid and learned more about the #ThisTimeImVoting campaign, which encourages young people to vote in the next European elections. The speakers of the campaign showed statistics about the political interests of youth in different countries. One of their solutions for a greater interest is for it to reach young people through social media, for example through well-known influencers who have a growing impact on youth nowadays. With this in mind, the participants voted on the altered paragraphs of every group in a simulation of the European Parliament, thus the final version reflected everyone’s shared ideas. At the end, the whole assembly voted on the new draft document on Youth Rights and made it an official part of the Youth Policy 2020 paper. Finally, the young leaders were handed the Youthpass certificates to show for their great work.